Passed over for the Tour de France and then told by RadioShack team manager Johan Bruyneel that he wouldn’t be riding any WorldTour races for the remainder of the season, Jakob Fuglsang has sent a message to the Belgian by winning the Tour of Austria today. The Danish rider finished safely in the peloton on the final stage of the 2.HC-ranked race, thus preserving his overnight lead of one minute 24 seconds over Steve Morabito (BMC Racing Team). Robert Vrecer (Team Vorarlberg) took third, one minute 52 seconds back. 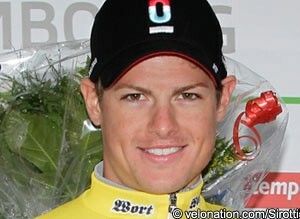 Fuglsang seized the jersey when he soloed to victory on the fourth stage, riding strongly on the Grossglockner climb. It means he goes away with strong memories of his time in the race. Today’s 122.8 kilometre stage to Vienna was won in a bunch gallop by Daniele Colli, the Italian Team Type 1 rider who returned to the sport after suffering from a tumour in his left leg. He beat Alexey Tsatevich (Katusha), Blaz Jarc (Team NetApp) and the rest of the peloton to the line, netting an emotional victory. Having taken many high placings since his return, winning turns a page and will hopefully be followed by other triumphs. As for Fuglsang, the race is his second stage race victory in a month after he came out best in the Tour of Luxembourg in June. He missed the Giro d’Italia due to injury but those two winning performances have confirmed that he has moved to a new level this season. He’s a more complete rider after becoming leaner and while he wasn’t selected for the Tour due to RadioShack Nissan politics, will surely be on the wishlists of several teams now. “It’s another victory in a national tour, which always demands different skills. You need to be strong in the climbs, good on the TT and have a great team to consolidate the effort you put in,” he said. “It’s been a good challenge this week and I’m proud of the way I won. Morabito’s result is his best since taking second overall in the Jayco Herald Sun Tour in 2007. “I'm really happy with this race and my level of racing,” he said. “I was there in the climbs, I was there in the time trial and I was there today so I was really happy with the team and the work they did. It was a week-long effort to get the podium. RUS 2 Alexey Tsatevitch (Katusha Team) s.t. SLO 3 Blaz Jarc (Team NetApp) s.t. ITA 4 Danilo Napolitano (Acqua & Sapone) s.t. NED 5 Boy Van Poppel (UnitedHealthcare Presented By Maxxis) s.t. SUI 6 Danilo Wyss (BMC Racing Team) s.t. AUT 7 Marco Haller (Katusha Team) s.t. ITA 8 Sacha Modolo (Colnago CSF Bardiani) s.t. BEL 9 Guillaume Van Keirsbulck (Omega Pharma - Quickstep) s.t. AUT 10 Jan Sokol (Team Gourmetfein - Wels) s.t. ITA 11 Andrea Pasqualon (Colnago CSF Bardiani) s.t. AUT 12 Daniel Schorn (Team NetApp) s.t. ITA 13 Pier Paolo De Negri (Farnese Vini - Selle Italia) s.t. GER 14 Robert Förster (UnitedHealthcare Presented By Maxxis) s.t. AUT 15 Christoph Sokoll (Tyrol Team) s.t. BEL 16 Iljo Keisse (Omega Pharma - Quickstep) s.t. BEL 17 Nico Sijmens (Cofidis - Le Credit En Ligne) s.t. FRA 18 Laurent Pichon (Bretagne Schuller) s.t. AUT 19 Mario Schoibl (Tyrol Team) s.t. GER 20 René Weissinger (Team Vorarlberg) s.t. FRA 21 Armindo Fonseca (Bretagne Schuller) s.t. AUT 22 Martin Weiss (Tyrol Team) s.t. ITA 23 Francesco Di Paolo (Acqua & Sapone) s.t. AUT 24 Adam Homolka (Wsa Viperbike Karnten) s.t. ITA 25 Christian Delle Stelle (Colnago CSF Bardiani) s.t. GER 26 Florian Bissinger (Team Vorarlberg) s.t. AUT 27 Martin Schoffmann (Wsa Viperbike Karnten) s.t. FRA 28 Mickael Buffaz (Cofidis - Le Credit En Ligne) s.t. LAT 29 Aleksejs Saramotins (Cofidis - Le Credit En Ligne) s.t. ESP 30 David Arroyo Duran (Movistar Team) s.t. SUI 31 Marcel Wyss (Team NetApp) s.t. KAZ 32 Andrey Zeits (Astana Pro Team) s.t. AUT 33 Thomas Rohregger (RadioShack - Nissan) s.t. ITA 34 Jacopo Guarnieri (Astana Pro Team) s.t. AUT 35 Georg Preidler (Team Type 1 - SANOFI) s.t. AUT 36 Andreas Hofer (Team Vorarlberg) s.t. AUT 37 Markus Gotz (Wsa Viperbike Karnten) s.t. SUI 38 Steve Morabito (BMC Racing Team) s.t. ESP 39 Jonathan Nicolas Castroviejo (Movistar Team) s.t. AUT 40 Stefan Praxmarer (Tyrol Team) s.t. BEL 41 Yannick Eijssen (BMC Racing Team) s.t. SLO 42 Robert Vrecer (Team Vorarlberg) s.t. KAZ 43 Alexandr Dyachenko (Astana Pro Team) s.t. AHO 44 Marc De Maar (UnitedHealthcare Presented By Maxxis) s.t. ITA 45 Danilo Di Luca (Acqua & Sapone) s.t. RUS 46 Pavel Brutt (Katusha Team) s.t. AUT 47 Dominik Hrinkow (Team Vorarlberg) s.t. ESP 48 Sergio Pardilla Bellon (Movistar Team) s.t. RUS 49 Maxim Belkov (Katusha Team) s.t. LUX 50 Laurent Didier (RadioShack - Nissan) s.t. USA 51 Brent Bookwalter (BMC Racing Team) s.t. FRA 52 Arnaud Labbe (Cofidis - Le Credit En Ligne) s.t. SUI 53 Rubens Bertogliati (Team Type 1 - SANOFI) s.t. AUT 54 Josef Benetseder (Team Vorarlberg) s.t. ITA 55 Fabio Taborre (Acqua & Sapone) s.t. FRA 56 Sebastien Duret (Bretagne Schuller) s.t. DEN 57 Jakob Fuglsang (RadioShack - Nissan) s.t. FRA 58 Geoffroy Lequatre (Bretagne Schuller) s.t. NZL 59 George Bennett (RadioShack - Nissan) s.t. AUT 60 Hans-jorg Leopold (Wsa Viperbike Karnten) s.t. ITA 61 Marco Pinotti (BMC Racing Team) s.t. RUS 62 Petr Ignatenko (Katusha Team) s.t. KAZ 63 Yevgeniy Nepomnyachshiy (Astana Pro Team) s.t. USA 64 Benjamin King (RadioShack - Nissan) s.t. COL 65 Carlos Alberto Betancur Gomez (Acqua & Sapone) s.t. FRA 66 Laszlo Bodrogi (Team Type 1 - SANOFI) s.t. FRA 67 Johan Le Bon (Bretagne Schuller) s.t. AUT 68 Marc Obkircher (Tyrol Team) s.t. ITA 69 Angelo Pagani (Colnago CSF Bardiani) s.t. AUT 70 Florian Gaugl (Team Vorarlberg) s.t. CZE 71 Leopold Konig (Team NetApp) s.t. SLO 72 Jure Golcer (Tyrol Team) s.t. ESP 73 Javier Mejias Leal (Team Type 1 - SANOFI) s.t. AUT 74 Harald Totschnig (Tyrol Team) s.t. AUT 75 David Wöhrer (Tyrol Team) s.t. AUT 76 Riccardo Zoidl (Team Gourmetfein - Wels) s.t. AUS 77 Benjamin Day (UnitedHealthcare Presented By Maxxis) s.t. ESP 78 Benat Intxausti (Movistar Team) s.t. FRA 79 Florian Guillou (Bretagne Schuller) s.t. SLO 80 Simon Spilak (Katusha Team) s.t. LTU 81 Ignatas Konovalovas (Movistar Team) s.t. FRA 82 Damien Monier (Cofidis - Le Credit En Ligne) s.t. FRA 83 Rudy Molard (Cofidis - Le Credit En Ligne) s.t. ESP 84 Markel Irizar Aranburu (RadioShack - Nissan) s.t. SUI 85 Oliver Zaugg (RadioShack - Nissan) s.t. BLR 86 Branislau Samoilau (Movistar Team) s.t. CZE 87 Jan Barta (Team NetApp) s.t. ITA 88 Alessandro Bazzana (Team Type 1 - SANOFI) s.t. RUS 89 Alexander Efimkin (Team Type 1 - SANOFI) s.t. SLO 90 Matej Marin (Team Gourmetfein - Wels) s.t. IRL 91 Philip Deignan (UnitedHealthcare Presented By Maxxis) s.t. ITA 92 Massimo Codol (Acqua & Sapone) s.t. BEL 93 Serge Pauwels (Omega Pharma - Quickstep) s.t. ITA 94 Diego Caccia (Farnese Vini - Selle Italia) s.t. ITA 95 Stefano Locatelli (Colnago CSF Bardiani) s.t. ITA 96 Stefano Garzelli (Acqua & Sapone) s.t. ITA 97 Cesare Benedetti (Team NetApp) s.t. ITA 98 Ivan Santaromita (BMC Racing Team) s.t. USA 99 Matthew Busche (RadioShack - Nissan) s.t. FRA 100 Yoann Bagot (Cofidis - Le Credit En Ligne) s.t. AUT 101 Andreas Graf (Team Gourmetfein - Wels) s.t. BEL 102 Maxime Vantomme (Katusha Team) s.t. BEL 103 Julien Vermote (Omega Pharma - Quickstep) s.t. FRA 104 Jean Marc Bideau (Bretagne Schuller) s.t. NED 105 Kai Reus (UnitedHealthcare Presented By Maxxis) s.t. BEL 110 Kristof Vandewalle (Omega Pharma - Quickstep) s.t. CZE 111 Frantisek Rabon (Omega Pharma - Quickstep) s.t. AUT 112 Lukas Pöstlberger (Team Gourmetfein - Wels) s.t. AUT 113 Matthias Brandle (Team NetApp) s.t. AUT 115 Paul Lang (Wsa Viperbike Karnten) s.t. ITA 119 Thomas Bertolini (Farnese Vini - Selle Italia) s.t. USA 123 Chris Jones (UnitedHealthcare Presented By Maxxis) s.t.